They are part of a collection named "DailyFrench" I created them over a year ago and there are now over a three hundred of them, and counting: A new one everyday. 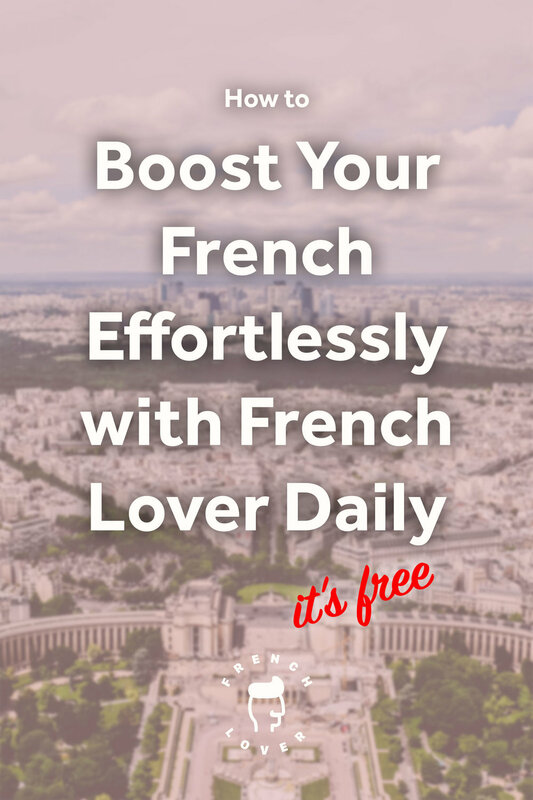 DailyFrench has been designed to let you learn French vocabulary and structures effortlessly while you relax and browse your social media feeds. Note, if you’re in a hurry, click here to jump straight to the steps to take full advantage of the French Lover Daily. By the way, did I mention? It’s totally free. Our brain recalls 20% of what we read but 80% of what we see. By associating the new words to a picture, you dramatically increase the chances of remembering it. French pronunciation is not always obvious and for this reason it’s good to hear my native voice, so you know how to pronounce. Those of us who have an auditive learning type will remember better if they also hear the words and the sentences. It’s definitely the case for me, and I know I’m not alone. A big drawback of most “word of the day” accounts out there, is that the words are given to you without any context. For this reason, even if you do remember the word, you are not likely to know how to use it in an actual sentence. To avoid this problem, each French Lover daily video features four example sentences to let you know how to use the new word. The sentences are in French on the video, but if you need a translation, you will always find it in the description. took my own advice I included in the French Lover daily videos all the details you need to be able to use the words straight away: nouns come with articles, verbs with preposition, adjectives with their feminine and plural forms etc. It would be so great if we could see a word once and remember it forever. Unfortunately our brain tends to discard all the information that we don’t see repeated often enough. For this reason, the daily French words are conveniently delivered to you at three different times. A preview on instagram right after lunch, the video is posted on facebook in the late afternoon and on youtube the next morning, where you can replay it as often as you want. All preview pictures are also uploaded to pinterest, so you can repin the ones you’d like to review later. You will benefit from following any of these accounts, and you’ll definitely get the maximum effect if you follow them all. How awesome is that? Instead of coming and going like most “word of the days” do, the French Lover daily words come one day and stick around forever. Because some words are just better learned together, once the new videos have been released on youtube, I organize them in playlists around grammar topics, or vocabulary themes. It’s ideal to review the relevant topics before an exam or a test. Because not every word is relevant to you, there should be an easy way to select and keep the ones you want to learn now. Say no more! All you need to do is to visit the DailyFrench pinterest board, grab the words you like and pin them to your personal board to review them later. Learn French with no effort? Yes, please! 1- Follow me on instagram to discover the word of the day before everyone else, right after lunch (CET). 2- Like the FrenchFluency.net facebook page to have the new video featuring the word of the day delivered straight to your timeline at 6 PM CET. You have a question? Just ask in the comments, I will be happy to answer you very soon. Do not forget to click “like” if the video is helpful. 4- Afraid you won’t remember the words? Subscribe to the Daily French Pinterest board and pin the words you need to your own board so you can review them later. All the new words are pinned right after they have been published on facebook. 5 - Don’t forget to sign up for the newsletter and never miss any of the awesome updates on FrenchFluency.net (this website).